Cherry Red Casino is located in Nicosia, Cyprus. It is owned and operated by Rushpod Investments NV. Cherry Red Casino is powered by Real Time Gaming software. The software is available in a downloadable version as well as a no download instant flash version. Players can choose to play in real money mode or in fun mode. Players are able to access their financial and game history, including every bet you have ever placed at the casino, all winnings and detailed game results. You can also access all deposits and withdrawals you have made at the casino. Cherry Red Casino offers a comprehensive suite of games, including all of your favorite table games, card games, video poker, slots and progressive games. Players can choose from blackjack, Caribbean hold’em, Caribbean stud, let ’em ride, baccarat, red dog, war, pai gow, American roulette, European roulette, craps, sic bo, keno, bonus bingo and multiple variations of video poker. 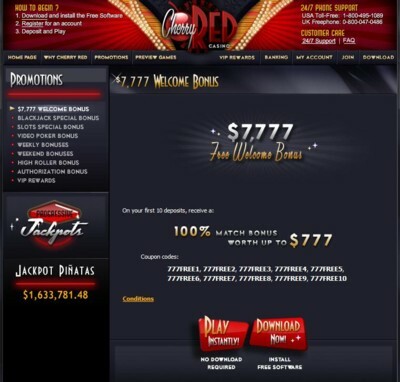 New players are eligible for a whopping $7,777 welcome bonus package divided over their first ten deposits at the casino. On each of your first ten deposits you will be eligible for a 100% match deposit bonus up to $777. High rollers who make a deposit of $1,000 at the casino will be eligible for a bonus of $1,500 on both their first and second deposit at the casino. The Black Cherry promotion is a 200% bonus worth up to $1,200 with no maximum cash out. This bonus can be used to play blackjack. The Cherry Reels bonus is a 400% bonus worth up to $2,400 with no maximum cash out. This bonus can be used to play slots. The Wild Cherry promotion is a 200% bonus worth up to $1,200 with no maximum cash out that can be used to play video poker. Players are able to earn comp points for every bet that they make. These comp points can be accumulated and once you have enough comp points, you can redeem them for cash through the cashier at the casino. Cherry Red Casino runs a VIP rewards program with great benefits for its members. Benefits include massive bonuses for each of five deposits per day worth up to $18,750, weekend bonuses, generous comp points conversion rates, higher table limits, a bonus welcome gift and more. If you have any questions when playing at Cherry Red Casino you can contact their customer service team which is available 24 hours a day, seven days a week. They can be contacted via telephone or email. There are specific email address for general enquiries, deposits, withdrawals and questions regarding downloading and installing the software. There are toll free telephone numbers available from the US, the UK and Canada. Players can make deposits using a number of safe and convenient methods. These include VISA, Master Card, American Express, Moneybookers, NETeller, JCB, ewalletXpress, Click2Pay, Eco Card and UseMyWallet. You are able to make withdrawals from your Cherry Red Casino account via wire transfer, UseMyWallet, Click2Pay, Moneybookers and eWalletXpress.